While everyone was belittling the foggy murk that was Sunday at the Icicle, 17 year-old Chris Leatherdale, who had hoped to check out at the Icicle itself, snuck off down the road to where the air was fresh(er) and clear(er) with Phil Dunnington and passed his Check Flight with flying colours. Now as if that wasn’t grand enough he then proceeded to sort out a remote camera and made a video of his solo flight, from Hungerford to Cadley, which lasted slightly longer than the required 30 minutes at a respectable 1hour 20minutes. It is a cracking video that doesn’t last anywhere near as long as the flight itself and will encourage any adventurer with great music and a fine drag landing to finish off with. Big ones to Chris. Check it out on Youtube. http://www.youtube.com/watch?v=3C9X5u9nyAo&feature=youtu.be&a footnote-seems the vid is currently not available-shame. The Type Certificate Data Sheet for Balony Kubicek type BB balloons, BA.003 was updated to issue 26 on the 15 January 2013. The changes seem to relate to BB45 types. This is the second update from Kubicek to take place so far this year for which there isn’t a prize! The details were updated in the TCDS bit of the pages almost as it ‘appened. Easiest way to check the numbers and issues is by going to http://easa.europa.eu/certification/type-certificates/balloons.php and scrolling down. Click on the icon to download the TCDS you want. To help inspectors better assess the true size and depth of scratches on cylinders Cameron Balloons have come up with a very simple bit of stainless steel tube 60mm long into which five grooves have been machined into the external face to a depth of 0.1mm, 0.2mm, 0.3mm, 0.4mm and 0.5mm. 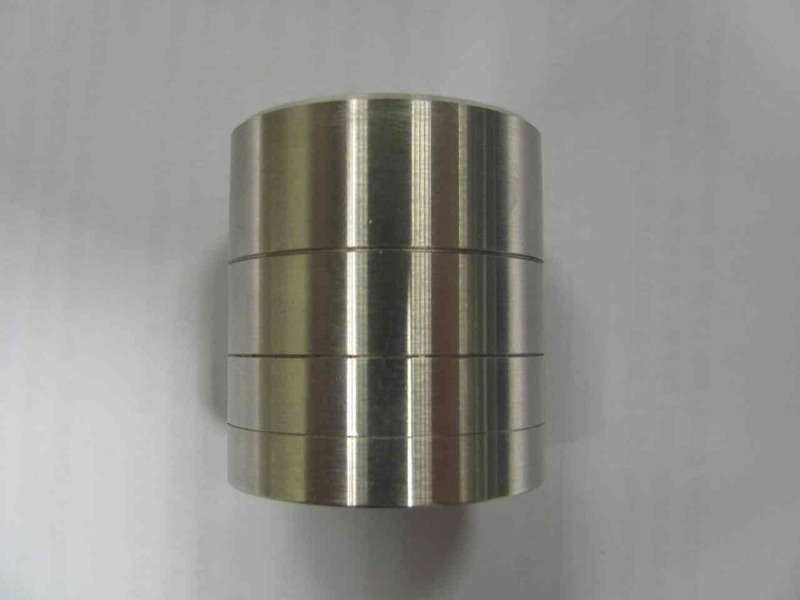 It will have a smooth machined finish rather than be polished. 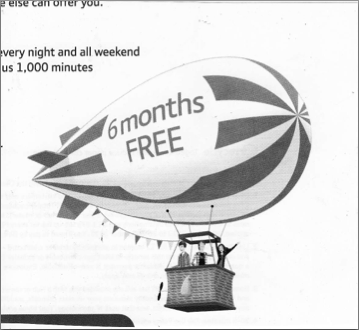 Cameron Balloons have come up trumps by offering these units at cost, as a service to support the BBAC Inspectorate. Currently the cost per unit is £18.00 (inclusive of VAT) plus postage and you can pay through the BBAC's Technical Office Shop, by sending the Technical Office a cheque for £18.00. This offer may not last forever so best contact the BBAC Technical Office at cto@bbac.org or Cameron Balloons direct sales@cameronballoons.co.uk for full details. Keen to keep us upto date with the latest developments on the eagerly awaited new EASA licences (can’t wait!) the CAA have just sent out their latest take on the situation. They say that as most balloonists are now aware the UK CAA is already issuing EASA Part-FCL licences (steady boy as no Approved Training to go with balloony ones yet), with the option of having one’s existing UK licence re-issued in tandem and then valid for life (subject to recency and currency requirements) its best to pay attention to the advice they are giving. The latest date that pilots will need to hold a Part-FCL EASA licence is officially 7th April 2015 although most balloonists are expected to convert their licences within the year immediately preceding this date and only after at least one Approved Training Organisation (ATO) has been established to support them. Currently though, all re-issues (or new issues) of the UK CPL(B) and PPL(BA) are now in the new style, which equates to a handsome single sheet of A4 paper, printed on both sides. The information contained on it is now printed much smaller and, inline with the shrinkage, a much smaller licence holder is provided to hold the licence, medical and other associated papers so best buy your own holder (folder!). Several balloon pilots who have got these inbetweeny licences have commented that it will now be very difficult for balloon examiners to complete the Certificate of Test or Certificate of Experience given the very small space provided. Unfortunately, the size and style of Part-FCL licences is dictated by EASA and true to form being all correct and proper our UK CAA has chosen to “mirror” this with its own national licences rather than adapt the space to better meet the requirements. Well it probably means they save money if they don’t get involved with the design. Even though the new licence contains “page numbers”, along the lines of one of those handy folding pocket maps, within the said single sheet of A4 (each fold type-of-thing), it MUST NOT be cut into pieces in order to fit inside the new licence holder. The CAA’s Licensing Department state this within the new CAP 804, which naturally everyone has read before getting their swanky bit of A4, and if you are daft enough to cut it up so it actually fits in the holder provided a tad easier then beware, you may invalidate it and become unsafe to fly. The CAA would love to hear from you regarding these smashing new licences so please drop the Licensing Department a line. All feedback regarding these new licences will be forwarded to the CAA’s Licensing and Training Standards. You probably won’t get a reply mind. Drop the darlins a line at fclweb@caa.co.uk. I’m still trying to get a new purple folder for my old CPL which not only fell to bits within one year but was brilliant at removing all the black ink from whatever was up against the transparent plastic wallet. Be interesting to see what the properties of the new folder will be. In case you are (or not) wondering where the source of the next few articles are coming from then let us explain. Its now a few years ago that my dad went into a home so pretty much everything was boxed up and crammed in the upstairs rooms or attic, standard procedure I believe, so son and friends could move in and look after the house….not entirely accurate as statements go, anyway after he died we went through much of the stuff again but still found nothing of any value so more boxes of toot (not pronounced as ‘toot toot’ in train but more like ‘tou-’t’) went to the Hospice Shop and the remaining non-toot boxes got squeezed into the already sagging loft with a vow to sort it later. Eventually it could be put off no longer so during the quieter days of November 2012 the time came to get it cleared and so the blitz started. Box by box we carted it round and sorted through the carefully wrapped and unsorted contents. We had an Ebay moment but got over that PDQ and started taking more stuff up to the Ian Rennie Hospice Charity shop, quite appropriate really. Books were sorted and personal bits and bobs looked at and then reboxed. Typically we now had boxfuls of stuff here and the back bedroom was soon full and we weren’t anywhere near halfway. With a bit of time off for good behaviour over Christmas it was decided that the treasures really would have to be sorted once and for all. The process is not easy. You now have to get tough and go through it all again so even more stuff gets chucked or ends up at the charity shop. Eventually all you should end up with is ‘interesting stuff’ which can be interned for a further period before that too gets a going over or recorded for posterity! 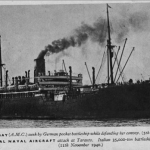 The Old Boy was nothing if not eclectic when it came to interests but strong contenders were London Transport (buses, trams, trolleybuses and trains), the Royal Navy, history in general, aircraft and painting. So as quite a few bits and bobs have come to light we will be writing all of it up in due course. This will explain why there is an article on Salome and The Jervis Bay now lurking on the site. OK, we did find some balloony stuff which we’ll dig out along with an article or two written by Pete Bish of Zebedee in long-hand. 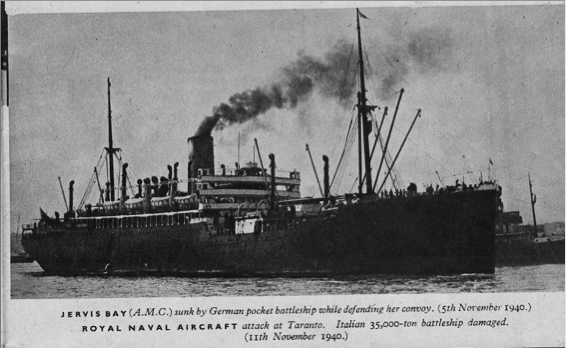 Just after we’d finished the Salome and Jervis Bay article an old Naval Magazine, Dittybox, turned up in the bottom of a box of old stuff and a couple of pages in was a picture of HMS Jervis Bay. We’ve also added it to the bottom of the article. Quite what that actually means is open to a bit of interpretation. Does it mean that bumbling along straight and level comes under ‘other phases of flight’? The point has been raised that this could be particularly relevant to a single pilot balloon operation where the pilot takes passengers’ photographs during flight whilst serving liquid refreshments in flight. That may be OK on a private flight though. So short answer is, get an air hostess or a co-pilot. Ah, ha, just discovered PEDs are not pills or bright flashing lights for pushbikes but ‘Portable Electronic Devices’. For the whole story, only a few pages honest see http://www.caa.co.uk/docs/33/SafetyNotice2013003.pdf. *CAT is Commercial Air Transport not dropping live animals. 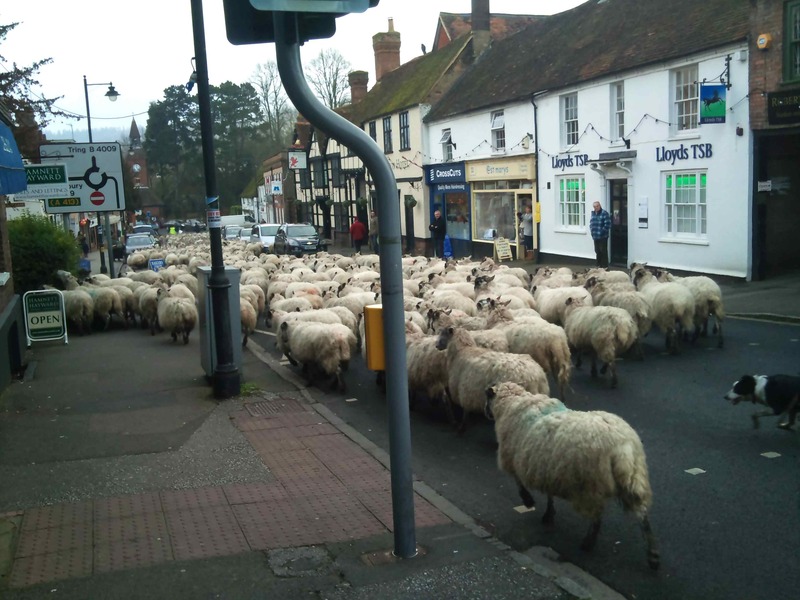 Every year for as long as I can remember Tony Mogford moves his sheep through the village and into the farm ready for lambing. In a valiant attempt to disrupt the traffic this is usually done midweek. It also means most of the owners of the gardens that get rampaged are out at work. This is quite an undertaking as they first trot down Dobbins Lane, which is full of frightfully double-barrelled houses, visiting many a garden as they go, then turn left down the High Street causing a fair degree of traffic mayhem and with a few visiting the Swan, Red Lion and Budgens and eating the hedge outside the Estate Agents on the way before turning right by the Clocktower and up the Tring Road and swiftly home into Bank Farm. This is achieved with a team of two or three (and the occasional hapless onlooker) with Joyce’s Collie bringing up the rear (Dotty doesn’t get invited sadly). This year was just as exciting and, as predicted, brought the village to a standstill. Fortunately some clever person filmed it all and popped it on Youtube set to Baa Black sheep performed by the sheep themselves. Once HS2 comes through the High Street things will be very different but I bet it’ll make the news! 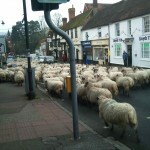 Check out Wendover Sheep at www.youtube.com/watch?v=XNb4Ouc2UXU. If you are a member of The British Balloon & Airship Club the BBAC President’s Dinner is to be held on Saturday February 16th at the Donnington Grove Country Club, Newbury, Berkshire. The BBAC is lucky to have Anthony Smith as its President, an extraordinary and charming man who has had more adventures in his life than most of us have had balloon flights. The BBAC would like to honour Anthony for everything he has done for ballooning in the United Kingdom and for adventurers everywhere. Tickets are £35 per person, which includes a three course meal with wine, followed by coffee and petites fours. Donnington Grove Country Club is sponsoring the bubbly and canapés on arrival in the Cloud room and there is a private bar for the guests. The venue has two fields available for balloon launches, if anyone feels like bringing a balloon and the weather holds out. It is also a golf club with 500 acres of land to split between ballooning and golf. Tickets can be obtained by BBAC members through the BBAC On-line shop. Or contact Jenni d’Alton, Chaucers Oare, Hermitage, THATCHAM, Berks RG18 9SD or email membership@bbac.org. Just down the road in the village of Ford the locals are up in arms about the potential arrival of a wind turbine. Can’t say the local swan population is too enamoured either. Anyway they decided to have a bit of a protest so reckoned on tethering a light-weight blimp 101 metres above the ground on the proposed site for three days to show the local residents exactly how high the structure would be. All went well for a few hours until the wind got up and after reeling it in a few times in an attempt to save it the blimp eventually it ended up in a tree. Amongst the arguments they have put forward in their objections is that there is not enough wind at the site to make it viable! Well sharp looking in keen-cut stainless with anodised bits, and having appeared in person at the Icicle Meet, Cameron Balloons have just announced that their new Safire burner has passed its trials in Italy. They report that ‘The eagerly awaited high-power Cameron Safire burner has successfully completed a week of flight trials in Italy. 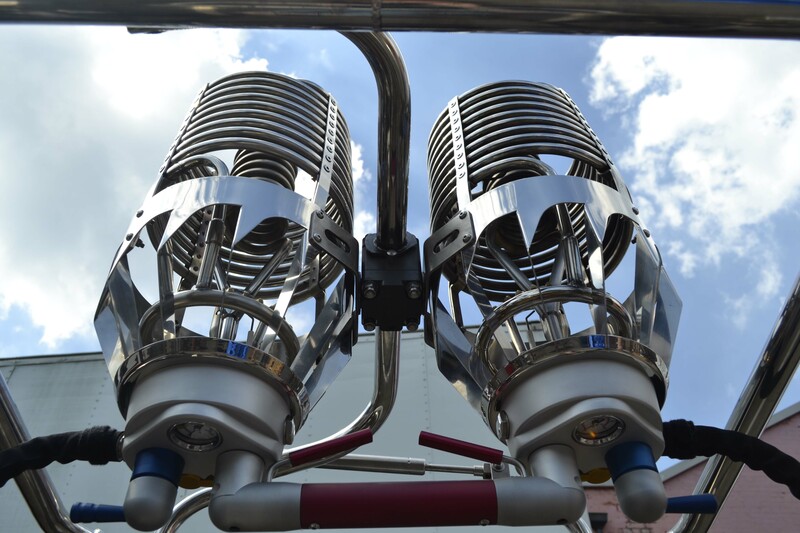 Safire not only produces 50% more power than traditional hot-air balloon burners but the tests also showed that it was particularly effective with low fuel pressures. Safire is so powerful that in twin configuration it can replace a triple, which means much less cost and much less weight. 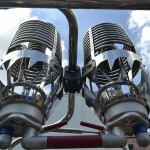 And if your balloon usually needs four burners then a Safire triple will provide you with more heat output than a conventional quad. Again at less cost and with a great saving in weight. Unlike some burners Safire has no sharp transition from low powered flame to maximum power - controls act in the traditional manner and with a feel which pilots will immediately recognise. This new rides burner is also very good looking, its futuristic stainless steel can being complemented by a silver anodised manifold block’. Now we reckon you can’t beat a good looking rides burner. Good on yer Sophie. 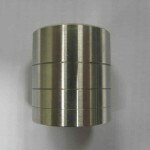 It is currently recommended for use with envelopes from 210 upwards in double or triple configurations. Following the flight trials it will now undergo certification and is expected to be available for purchase mid 2013. No price available at present. 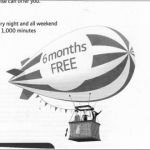 For more details contact enquiries@cameronballoons.co.uk. Black Horse EGM thingy 8th February 2013 - Reminder A gentle nudge to remind you that following the AGM of the Black Horse Balloon Club last year (which managed a reasonably poor turnout), it was decided to hold an EGM to look at the future running of the Club on Friday 8th February 2013 at 7.30pm for 8pm at Great Missenden Memorial Centre HP16 0PE. There has been a steady decline of the Club over the past few years not helped by the state of the pub itself. Now that is all sorted, and very fine it is too, it is hoped interest in the club can be re-vitalised so an open EGM was decided where it is hoped that members old and new, current or not, will attend and help get the Club back up and running again. The pub has had a major make-over and is really very nice with cheery staff, good ale and food. Outside the front seating area and rear garden has been smarted up beyond recognition and is great for families and children. The launch field has been made far more secure and tidied up with better parking. The pub offers a very warm welcome. The Black Horse still has its clubhouse and there is a re-fuelling tank on site. Don’t forget the 8th February. Please come along, drinks at the pub after (before for some no doubt! ).